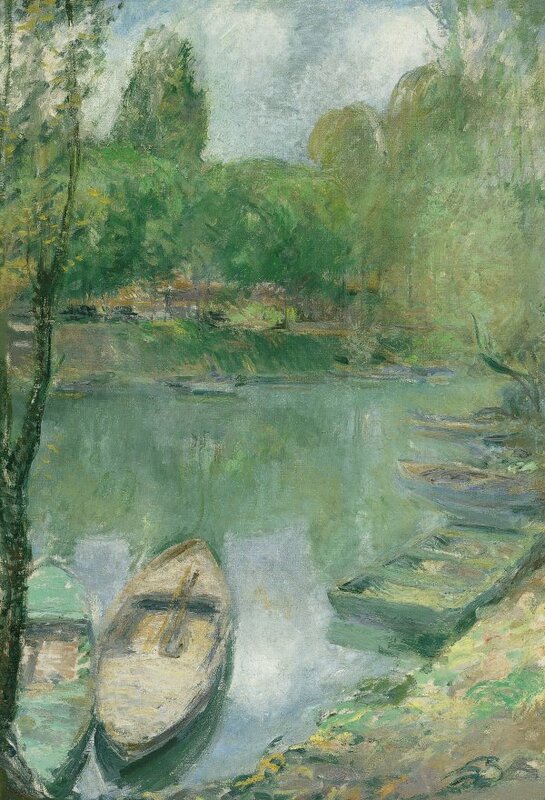 In Boats Moored on a Pond Twachtman has evoked the idea of what appears to be a European pleasure-spot, although unlike the landscapes of the French Impressionist, no human figures languish within his bucolic scene. 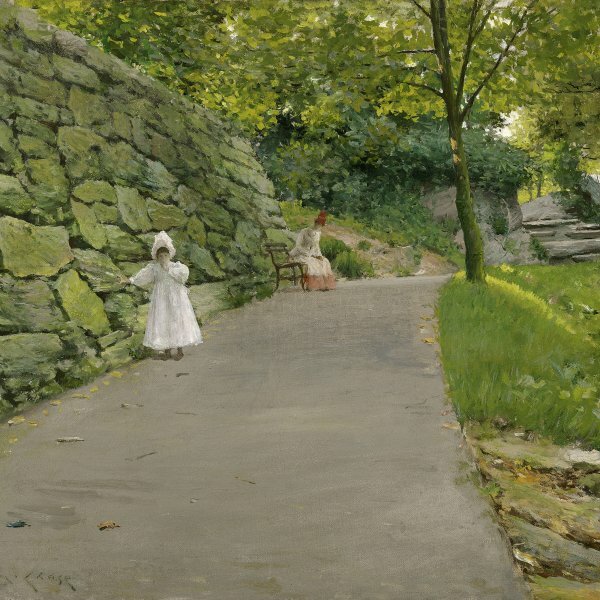 The painting is assumed to have been painted after 1890 and in many ways closely relates to his paintings of Gloucester painted in 1901-1902, the last two years of his life. 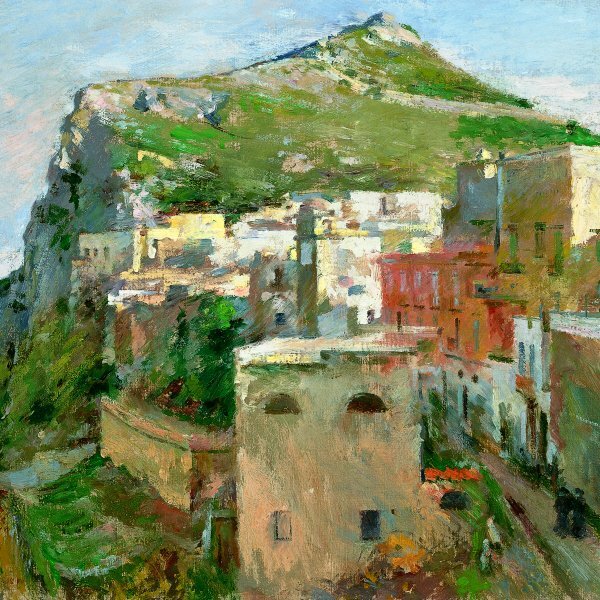 It was at this time, John Douglass Hale notes, that he moved away from the delicacy found in his Greenwich paintings, returning to the impulsive brushwork from his Munich period. More importantly, Twachtman began to again include black as part of his palette. The landscape may have come out of a brief trip the artist took to Honfleur, France in 1901. The composition reflects the influence of Japanese art, discovered by Twachtman and his friend J. Alden Weir around 18943 The deep recession of space created by the diagonal zigzag pattern of the boats on the right is flattened by the vertical shapes of the boats, paralleled by the black trunk of the tree, on the left. The tree does not become an integral part of the composition, but serves to emphasise the flatness of the pictorial surface. The foreground boats establish the warm and cool tonalities of the overall composition; their shapes create a pattern that is carried through to the bulbous forms of the distant trees and the echoing arrangement of the clouds. As his friend Eliot Clark wrote of Twachtman: "He saw in nature the means for an arrangement of form and colour; he sought not so much the beauty of a part as the relation of parts to an organized whole."